UNCEDED COAST SALISH TERRITORIES — Ten Year Tent City has been served with a new trespass notice. 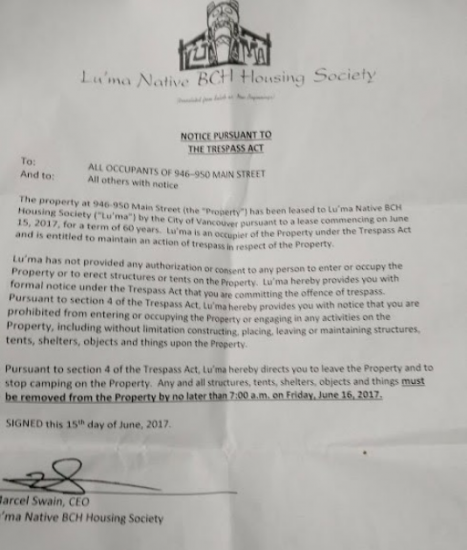 Unlike the previous notice which was issued by the City of Vancouver, the owner of the empty lot at 950 Main St., the new notice bears the logo of Lu'ma Native BCH Housing Society and the signature of Marcel Swain, the CEO of Lu'ma. 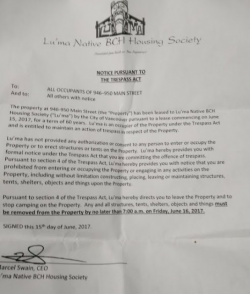 The notice states that the lot has been leased to Lu'ma Society for a term of 60 years starting on June 15th, 2017 and the occupants must vacate by no later than 7 am on Friday, June 16th, 2017. The leasing of this property to Lu'ma follows a court ruling on May 17th which turned down the City's request for an injunction to remove the camp from the publicly owned lot. The ruling by Judge Sharma supported homeless people's access to safety and security over the City's use of its private property. The City's sudden move to lease it out to a non-profit organization and the subsequent trespass notice dodges responsibility for the dire housing needs of camp residents as well as the 2,200 people counted as homeless people in Vancouver. It demonstrates the City's determination to circumvent the court ruling, recruiting a non-profit organization who can present as a property owner less beholden to the public good. The City of Vancouver is maneuvering to protect its property rights from homeless people who only seek a safe place to survive the dangers of homelessness. This is a hateful and irresponsible act from a civic government; the new trespass order violates the human rights of the residents of the camp and the recent ruling of the Supreme Court of BC. We call on the City of Vancouver to take responsibility for the housing crisis they have created, and house all 2,200 homeless people in Vancouver. We call on supporters to join us on the site tomorrow morning between 7 am- 10 am to be witnesses if the cops move into enforce the trespassing notice. Call Maria at 604 500 2731 for more information. I love your news in fact it is usually the highpoint in my day when i can finally get to the newspaper and find a place to go to when i am in distress of whether poverty exits at all and if it does exist is it in every crevice of our bodies, and in our minds.I have been reading it and almost abiding by it, i know my friend gets terrified and ferreted at even the slightest hint of it. I am wondering if anybody can tell me what they think about that. Your paper helped me to see all the crevices, inept places in the mind and gave me access to a lot of information about others that are alike. I am a grandmother to a native kid and a great grandmother to the spanish irish and english kids i adore and that made me be comfortable in your paper for all reasons. i was at a tent city and was totally disabled by the attitude of poverty all together. Poverty is third world but it seems to me we certainly have an affiliation to make it or to make it go away...so what is up. I now have a conscience for a reason and a reason to have a conscience is poverty and poverty is news and news is good when put across in a reasonable and proper manner.